Understand how to add a custom UI component to a template so users can alter the UI of their apps. Add a dashboard background color-picker to a configuration wizard. You’re jazzed by what you just learned about templates. You understand the different template JSON files and what each one does. You saw enough code up close to do something really cool with templates—something you think both the CEO and DTC partners will love. So you decide to implement one of your pet ideas. While you designed the Execs Only app, and other Analytics dashboards, you’ve wondered how you can make them more colorful. The Analytics UI lets you change some dashboard colors. You’ve got an idea to take that a lot further! You’ve been playing with a Visualforce page custom UI component—a color-picker. And you want to add it to Execs Only. Your idea is that partners could use the picker to modify dashboard background colors. They could choose their corporate colors, or add other colors to make dashboards really stand out. We won’t say more about Visualforce here, since it’s the subject of its own Trailhead module, which you can find in the Resources section along with the Visualforce Developer Guide. 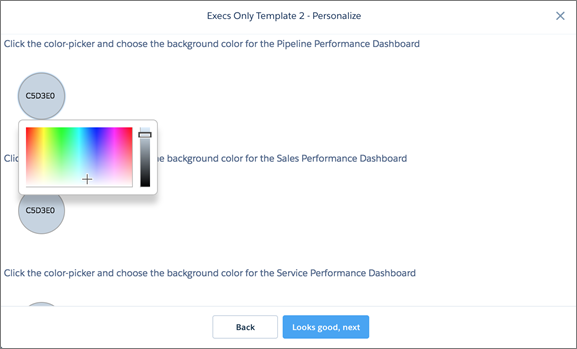 Suffice it to say that it made development of a color picker that can customize Salesforce pages really easy, and you’re excited to see if you can add it to the Execs Only app. And you’re pretty sure partners will get excited, too! We’ve made the code for the Visualforce color-picker available in the download for this unit. See the link to the download in the Resources section. Look for the color-picker files in pages and staticresources in the EATP2 folder, the folder containing Template 2 files. So you decide to add another page to the Execs Only wizard that lets partners pick their own dashboard colors. Let’s do it! The pages section of the directory includes the Visualforce page for the picker. The main page for the color picker is colorTest.page. We add three new rules to the rules section of the file. Each of them defines a set action to perform—the first on the Sales Performance dashboard, the second on Pipeline Performance, the third on Service Performance. The action: to set a dashboard background color based on selections made using the color-picker. As before with rules, each point to a variable. And finally, here’s ui.jsonIt adds a page to the wizard after the page with geography, new business, and Cases data questions. The new page includes UI elements to use the Visualforce color-picker to change the color of each dashboard. You can see the page that we added to the wizard in the previous unit, with the title “Create Execs Only App”. The new page has the title “Dashboard Styling” and refers to the color-picker by its name, “colorTest” in the vfPage section. What did we accomplish with the new JSON? We added a page to the wizard that lets our partners choose background colors for the Execs Only dashboards. Our excitable CEO’s going to go bonkers over that, right! And you’re so excited to show her that you grab your laptop and run down to her office. You’re in luck—she’s there, and she’s between meetings. You open your laptop, log in to Salesforce Analytics Studio, and show her the new version of Execs Only. If you use the Chrome browser, make sure it’s zoomed to at least 65% so Analytics pages appear as intended. Log in to the Developer Edition org you created in the first unit. Select Analytics Studio from the app picker. Click Create in the upper right and select App. Select Start from Template, then click Continue. Scroll to Execs Only Template 2 and select it. Then click Continue. Be sure to select Template 2. Click Continue until you get to a screen where you can name your app. Enter the name Exec App 1 and click Create. That brings up the app creation progress screen. It shows you what Analytics does behind the scenes while it creates the app. You go on to create the app, including the CEO’s tasteful color choice. We’re not going to tell you how to do that—it’s the challenge at the end of this unit, the last thing you need to do to complete your Introduction to Templates badge. Here’s the Sales Performance in hot pink, though. If data is missing from dashboards, run the Trailhead Data Manager again. See “Understand How Templates Work” in this Trailhead module for instructions. Be sure to run it on the app you create in the challenge. (Not the version of the app you created in “Understand How Templates Work”. Running the data manager is not required to complete your badge. Nice, eh? We can also tell you the CEO is knocked out. She’s sure your work has assured partner loyalty. She gives you the rest of the week off and mentions a surprise for you when you come in next Monday. Now that you’ve seen what goes into editing Analytics Templates JSON files, you’re ready to get going on your own templates. You need an app first, and you can learn all about that from Salesforce Einstein Analytics help, referenced in the Resources section. You can also play with the template we created for this unit, which you can download from the link in the Resources section. Remember: Creating the template and editing the JSON files are just the first steps in the process. You also have to deploy and test the template before it’s ready for distribution. You can read about the entire template development process in the Analytics Templates Developer Guide, referenced in the Resources section. There’s a lot more you can do with Analytics Templates than we’ve shown here. The examples we went through were intended to familiarize you with the structure of template files. 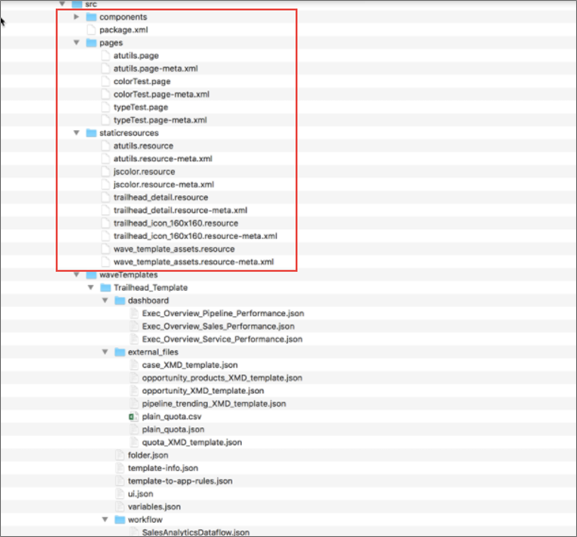 You’ve seen which file does what, and witnessed the power just a bit of JSON can deliver. You’ve also seen how creative you can get with what you add to a template. In this case, we added a Visualforce page with a custom UI component. Your imagination is the limit. 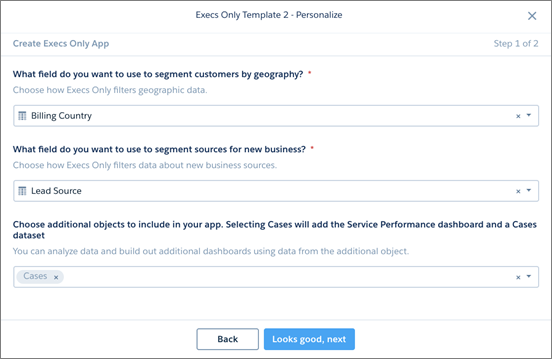 Analytics Templates along with the Einstein Analytics and Salesforce platforms give you a vast range of options for what you can do with your own templates. Download the code for this module. The download includes two files: EATP1 contains the basic Template 1, which you used to create the basic app. EATP2 contains Template 2, which includes the JSON modifications we describe in the module as well as the color-picker code.